“The next day, we both looked at the drawing, and decided that we really needed to come up with a story about how these characters came to be — and began to hammer out the story details. Deciding to make it an homage/parody to some of our heroes and inspirations — (and dedicating it to them) — we worked through the winter of 1983-84, and after finding a local New England printer, we borrowed money from my Uncle Quentin, and we printed the first 3,000 copies — premiering the book at a local Portsmouth comic convention May 5th, 1984. The piece should be familiar to most any Turtles fan, as it’s been reprinted many times over the years. It was sent out in the original press release package back in 1984 and found its way into much of the early press coverage. 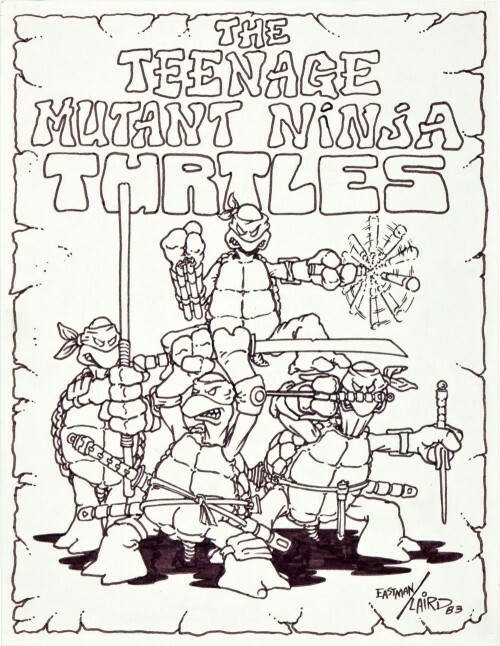 It was also shown in the First Comics graphic novel in 1986, a special edition reprint of the first issue from 1992, and as a pin-up in some of the Mirage black and white issues. Marker on paper. This piece has an image area of 8.5″ x 11″, and the art is in Excellent condition. From the Collection of Kevin Eastman.